The long awaited compilation CD from none other than Mr.Boogie Woogie (aka Eric-Jan Overbeek), the Hardest Working Man in Boogie Land. Awarded the title of Europe’s Best Blues Pianist, Overbeek celebrates 25 years of Boogie with this new release. Due to popular demand, Mr. 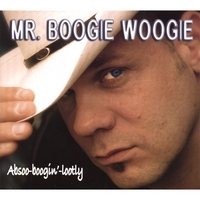 Boogie Woogie has released “Absoo-boogin’-lootly!” a 25 year retrospective of his favorite boogies recorded over the span of the Boogie Man’s career. The CD contains tracks from his first release “Bluesin’ and Cruisin’ right through to the recent day. It also includes a special tribute to his mentor Rob Hoeke (1943-1999), a Dutch Boogie Woogie institution. This track called Down South (recorded by Rob Hoeke in 1964) and previously unreleased by Overbeek, was and still remains the most played Boogie on the Dutch radio. Internationally known pianist and recording artist Mr. Boogie Woogie aka Eric-Jan Overbeek (1967) was recently awarded the prestigious honor of being named Best European Blues Pianist by the Les Trophées France Blues. Overbeek who hails from the Netherlands began playing piano at the young age of 8 and got his first regular piano playing job at age 12. "It only takes about 30 seconds of listening to know this guy belongs in America's most energetic roadhouses seven nights a week.... Arizona Daily Star. Put the CD on, and your fet start tappin', your fingers start snappin', and you just can't sit still no more. GREAT CD! Wonderful fun. Don't miss it. Mr Boogie Woogie is the king and this compilation proves it. I am so happy that he continues to play in Europe and the USA. His style is clean, energetic and you can feel the love! You can tell from his music that he lives to play. and thanks MrBW for playing on The Sacred Spud! Definitely one of the world's greatest piano players. I did not know anyone played music like this anymore. When can we hear it for real (live) in the USA?